In the midst of the Yo Gabba Gabba madness of this last weekend, I also realized I needed to freshen up my french manicure I had going on. The last one was a UV gel version (sorry I didn't get a pic of that one), so it lasted really well obviously, but my nails had grown and you could see the growth under the white tips of the manicure. So. Not. Cute. Have I mentioned that I love polished nails? Nice collection of all things pertaining to a manicure and pedicure... and yet I still go out and have it done more times than not. That's the laziness I guess. 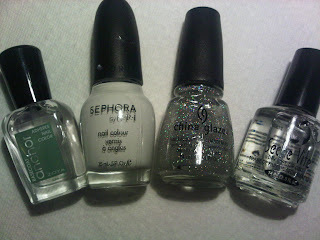 By the way, my favorite nail brands are Zoya followed by China Glaze. But I digress. 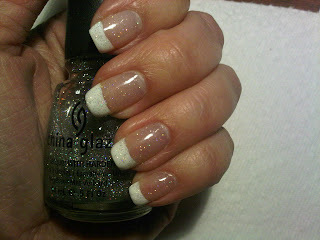 Not bad freehanded white tips if I do say so myself.